Do you have to buy another power strip when you run out of outlets? No! 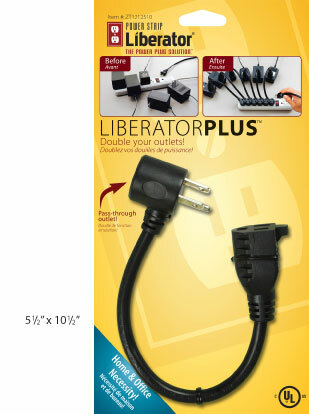 The Power Strip Liberator® Plus cord can liberate a power strip outlet while providing an extra outlet at the same time. Plug a big bulky power adapter into a Power Strip Liberator® Plus cord to move the AC adapter off the power strip, then connect a second device into the special pass-through socket on the top of the plug. These durable short extension cables meet or exceed all electrical code and UL requirements for safety.